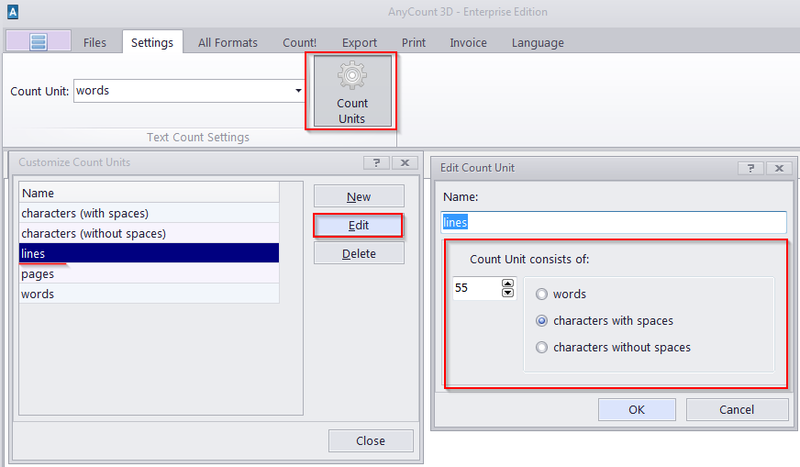 With AnyCount you can count files in different file formats using any volume unit you like. For example, you can count your files in words, characters with/without spaces, lines, pages, etc. Line counting is implemented by choosing the required number of characters for your lines. For example, you can select 60 characters and your default line. Then AnyCount will count your files and display how many lines (60 characters per line) are included in the file. You can customize your volume units in the way you prefer. For example: you can create a new volume unit - a line which includes 58 characters, instead of 60. Or you can create a line which includes a required number of words in it. So, you can recreate your preferred counting method using these customization options.